If you're looking for the world's best ski mountain, you just may have found it in Baldy. What makes up a perfect ski day? First a mountain with perfect pitch, consistent vertical from its 9,150 ft. peak down to the 5,750 ft. base. No flats, no plateaus - all downhill on a variety of slopes rated to your liking and ability. There's a place for crowds but it's not on a pristine ski slope. Sun Valley's lift capacity is 29,717 skiers/riders per hour and the average skier day is only 3,000. Lift service is waiting on you - you're not waiting in long lines. 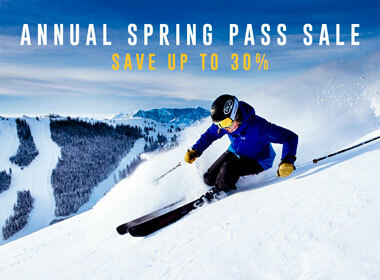 Sun Valley was aptly named because its brilliant sun shines 80 percent of the ski season in an azur blue sky. After all, it was "winter sports under a summer sun" that put Sun Valley on the map nearly 75 years ago. Bald Mountain can be accessed at River Run on the south and Warm Springs on the north. During the winter, finely appointed day lodges, a total of 12 lifts, including the new Roundhouse Gondola and 66 varied runs await on either side of the mountain. Bald Mountain's seemingly endless runs stretch 2,054 acres to the edges of the Sawtooth National Forest and slide another 3,400 vertical feet, top to bottom. During the summer, the world famous mountain is open to sightseers and adventurers, whether you want a relaxing day among the wildflowers, or a challenging journey through the rugged beauty of Idaho's wilderness. Baldy, as it is affectionately called, offers nearly 28 miles of hiking and biking trails. Feel free to tackle the trails yourself, or take along one of our expert guides to point out all the little things that make the Bald Mountain experience so unique. The River Run area of Bald Mountain is full of slopes covering all ranges of abilities. The most difficult runs, Olympic and Exhibition, are countered by an easier Olympic Ridge and Olympic Lane. From the top, intermediate skiers can choose Cutoff or Blue Grouse to Mid River Run to get back to the River Run Lift. From there it is a nine-minute lift ride back to the top. Advanced skiers can tackle Rock Garden, Exhibition or Upper Holiday runs for moguls galore. The Bowls along the top of Bald Mountain range in difficulty from easiest (Broadway Face) to most difficult (Little Easter Bowl). Intermediate skiers can begin at the left of the mountain and move to the right as they feel more comfortable. The Bowls are easily served by the Mayday chairlift, a seven minute ride back to the top. Warm Springs, named for the warm bubbling water at the base of the lift, is a great area of the mountain for the intermediate skier who needs a little more time to move on to the advanced stage. Filled with more difficult runs, Warm Springs glows in the afternoon sunshine. The top of the area is home to Warm Springs Face and most difficult runs International and Limelight. Halfway down, skiers can decide which of the more difficult runs they want to venture on ranging from Brick's Island to Cozy. Opened for Sun Valley's 74th ski season in 2009-10. The Roundhouse Express Gondola travels from River Run Plaza to the Roundhouse Restaurant area. From there, skiers and snowboarders can jump on the Christmas detachable quad for access to the top of Baldy. The new state-of-the-art Doppelmayr CTEC Detachable-Grip Gondola has 56 eight-passenger cars and carries 1800 passengers per hour, traveling 2,000 vertical feet in eight minutes. For questions and information about Roundhouse Restaurant please call 208-622-2800. From riding the world’s first chairlift in 1936 to riding 76 new rails, and a new 22 ft. super pipe, Dollar Mountain is quickly evolving into “Park Central,” the best pipe and park offering in the Northwest. Also awaiting skiers/riders this winter will be a lengthened Family Cross Course, a competitive cross course and three parks, progression, medium and large. This treeless, sun-bathed warm and friendly mountain also plays host to Sun Valley’s renowned Snowsports School catering to the needs of beginning skiers/riders with 10 runs, 628 ft. vertical rise and five lifts, including two new high speed quads. And there’s more: a new restaurant and childrens’ center, Carol’s Dollar Mountain Lodge, kids ski camps, ski shop and rental shop, a springtime pond skim, lots of parties and races and the little-known Elkhorn powder stash. Currently there are 5 lifts on Dollar Mountain: 2 Quads, 1 Triple, 1 Double and 1 Magic Carpet. 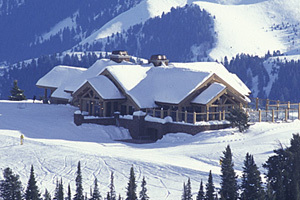 "Baldy," says resort owner Earl Holding, "is a regal mountain and it is only fitting that she wear a crown radiant with three precious jewels.” Those jewels are Baldy’s three distinctive and award-winning day-lodge facilities: the Warm Springs Lodge, Seattle Ridge Lodge and River Run Lodge. 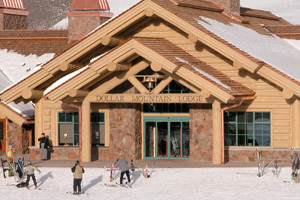 In keeping with this level of excellence is Sun Valley’s newest day lodge situated at the bottom of Dollar Mountain, Carol’s Dollar Mountain Lodge. 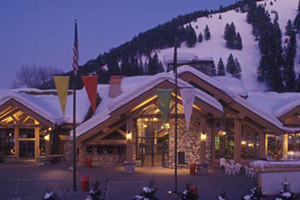 River Run Plaza at the base of Baldy creates a mini-village full of skier friendly services and amenities. Pete Lane's has all of your equipment needs covered ? rental, storage and tuning. The Brass Ranch offers smashing ski wear and all of the accessories. You can begin your day at River Run Lodge with a full breakfast and then stop back by for a delicious slope-side lunch. A bountiful salad bar, wok station, a fresh deli counter and oven-fired pizza await. River Run Lodge also sports a full bar and après ski entertainment on Saturday & Sunday afternoons. Perched atop the Seattle Ridge area of Baldy, the Seattle Ridge Lodge sets at an elevation of 8800 feet. With spectacular views of the Wood River valley and the surrounding mountain ranges, this spot on Baldy is a must see. Serving lunch, fare includes mesquite grilled entrees, wood-fired pizza, pastas, soups and gourmet salads. 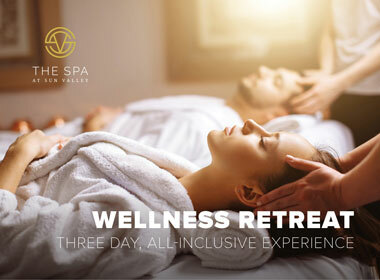 Sun Valley's newest mountain lodge was created with children in mind. But the beautiful European décor and the scrumptious menu attracts skiers and non-skiers of all ages. 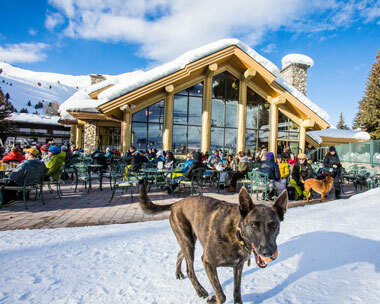 Located at the base of Dollar Mountain, the lodge is an easy walk from Sun Valley village, giving guests who don't ski an enjoyable 1/3-of-a-mile walk and a delicious lunch, either inside or on the sunny and heated deck. Breakfast and lunch are served daily during the winter season. Tour Bald Mountain with our experienced hosts – a great way to become acquainted with the mountain and facilities. Group tours available upon arrangement. 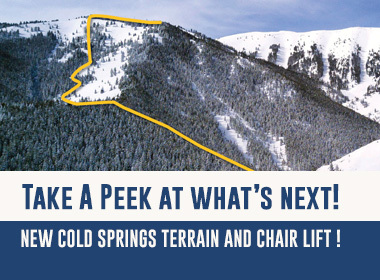 The exciting Cold Springs Canyon area on Bald Mountain, opening up 380 new acres of new terrain next season, will be available for a sneak preview starting in February 2019. 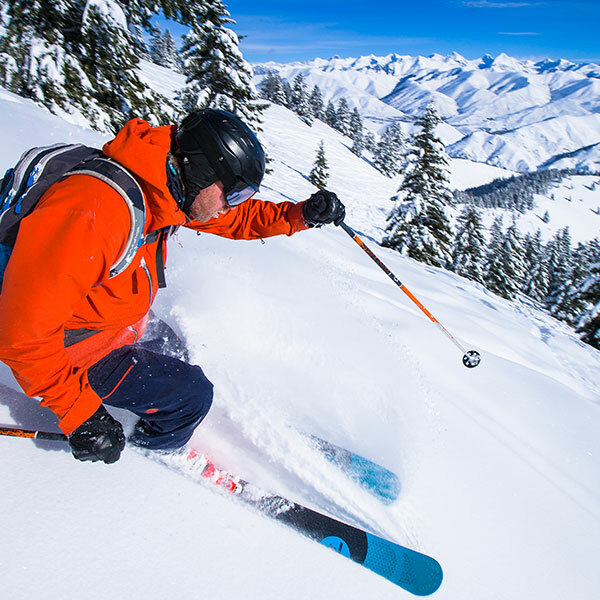 Offered on Tuesdays, Thursdays, and Sundays each week (weather and conditions permitting), groups of eight advanced skiers per day can take informative tours given by Sun Valley’s Ski Patrol and SnowSports instructors. 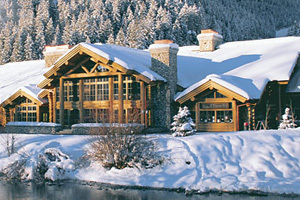 Guests meet at the Seattle Ridge Day Lodge at 10:00 am for an introduction and assignments. Due to the difficulty of the terrain, skiers will have an ability evaluation before taking the tour. There is no charge to participate, but reservations are required by registering at the Sun Valley SnowSports desk at River Run Day Lodge. Questions, please call the Sun Valley SnowSports desk at 208.622.2289. Enjoy a sunrise at the top of Bald Mountain, and experience a morning with a Sun Valley Ski Patroller. Join the SV Ski Patroller for two hours and help to prepare the mountain for opening. Two participants will be selected each week in a random drawing. A unique experience for guests who want to see how that smooth corduroy magically appears each morning on the mountain. Guests can ride with some of the best snow grooming operators in North America, and view the action first-hand.